This is a project to design and build a Guanella 1:1 (current) balun suited for up to 100W on HF with wire antennas and an ATU. Third part in the series.. Direct measurement of common mode current in an antenna system is the best indicator or whether there is a common mode current problem. 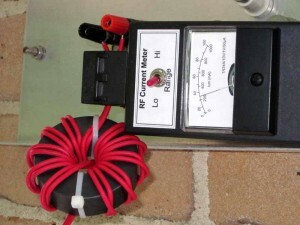 In Common mode current and coaxial feed lines, I mentioned that common mode current is easily measured. 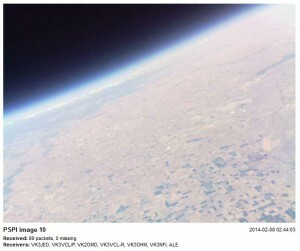 The Melbourne HAB team led by Andy, VK3YT, launched a balloon from Deniliquin in southern NSW on 08/02/2014. It was my pleasure, and frustration to some extent, to receive some SSDV traffic from the balloon. Above, the last pic before it burst at 37,000m (121,000′), what a great flight. Copy was difficult, first 70cm SSDV data received at VK2OMD at a distance of 480km and due to frequency variation of about 50Hz superimposed on slower drift, packet decode rates were low. More on the team’s work at http://projectspaceballoon.net . When baluns are used with open wire feed lines to wire antennas on HF, most commonly the main purpose is to suppress common mode current, to ensure that the current in one wire of the feed line is equal but opposite in direction to the other wire at that point. This is a project to design and build a Guanella 1:1 (current) balun for use on HF with wire antennas and an ATU. generous power handling given our 400W PEP limit, possibly 1kW in the future. I mentioned in my article WIA 4:1 current balun that the use of a single toroidal core in the above graphic compromises the balun. 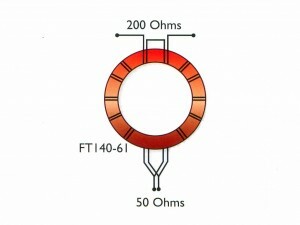 This article gives a simple, but more detailed explanation for the technically minded of why the shared magnetic circuit ruins the thing. Under the heading “Wind your own balun “, the WIA’s “Your entry into amateur radio” 2nd ed (The Foundation licence manual) gives advice to newcomers on constructing a 4:1 Guanella balun, a current balun. 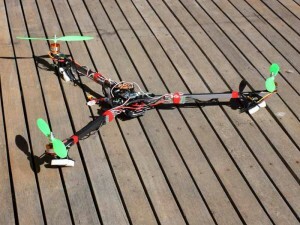 I ‘needed’ to experience a tricopter, and I chose a Hobbyking X900 frame kit. 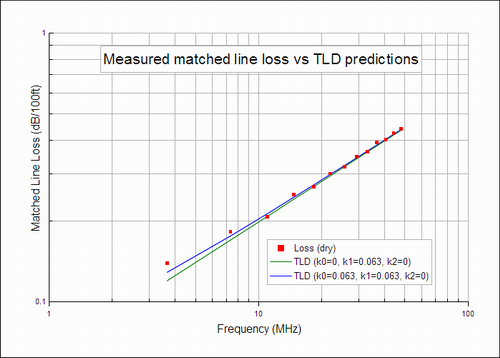 I tried to glean some useful information from G3TXQ’s measurements of windowed ladder line loss at Windowed ladder line loss – G3TXQ. In reviewing his article today (05/02/14), there is new information on a further series of measurements of the same line. The shape and position of the two lines does not reconcile with the formulas stated, so I digitised the data points and analysed the data set to try to find the most appropriate model for the reported measurements. Note that although the chart above is in imperial units, my work is usually in ISO metric units, and usually basic units. 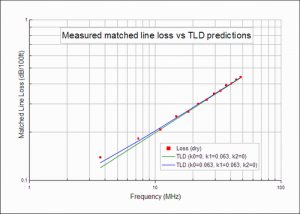 The digitised data points were converted to loss in dB/m, and fitted to the model MLL=k0+k1*f^0.5+k2*f using regression techniques. Note that the digitisation process introduces some noise, but it is estimated to be small compared to the noise in the underlying measurement data. The coefficients k0, k1, k2 were reviewed to test that there was sufficient data to support the hypothesis that they were not zero, and all three passed that test, the standard error of the coefficient was significantly less than the coefficient. 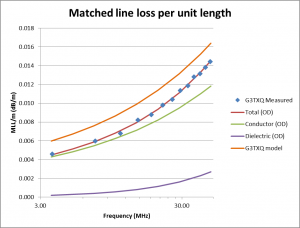 Note that k0 is not derived from a DC measurement of resistance as done by some modellers, but from the measurement data over the range of 3.6 to 48MHz in this case, and extrapolation beyond that frequency range increases uncertainty. 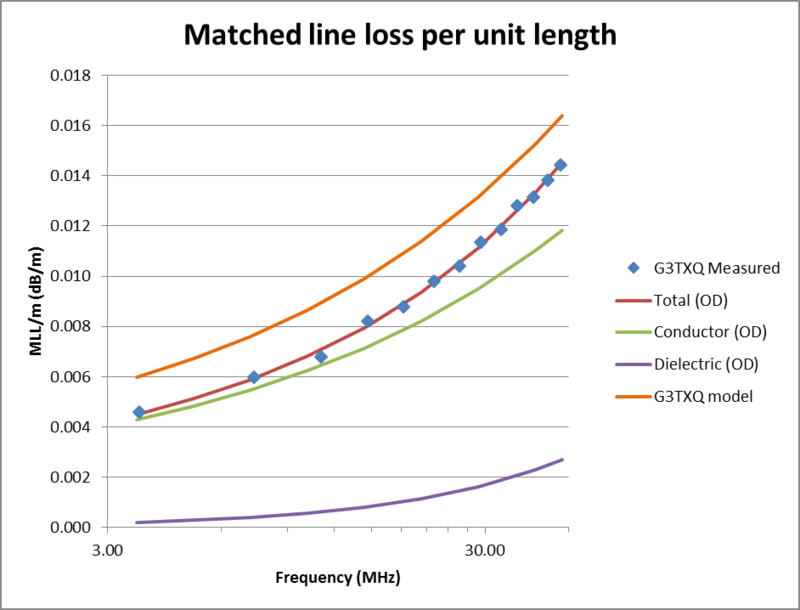 The above chart shows G3TXQ’s measurements as digitised from his published graph, and it shows the components of loss indicated from the model I built (the k0 component is allocated as conductor loss). The “G3TXQ model” line is equivalent to his MLL=0.063+0.063*f^0.5 dB/100′ converted to dB/m, and as you can see it is not a good fit to the measurement data points, nor does MLL=0.063+0,063*f^0.5 dB/100′ reconcile with the blue line on G3TXQ’s chart earlier in this article. G3TXQ’s measurement points (as digitised) are quite a good fit to the model MLL=0.001456+1.499e-6*f+5.631e-11*f dB/m where f is in Hz, and provide a good predictor of MLL over 3.6 to 48MHz. The 1245SF props arrived and replacement HK922 servo, both were fitted. 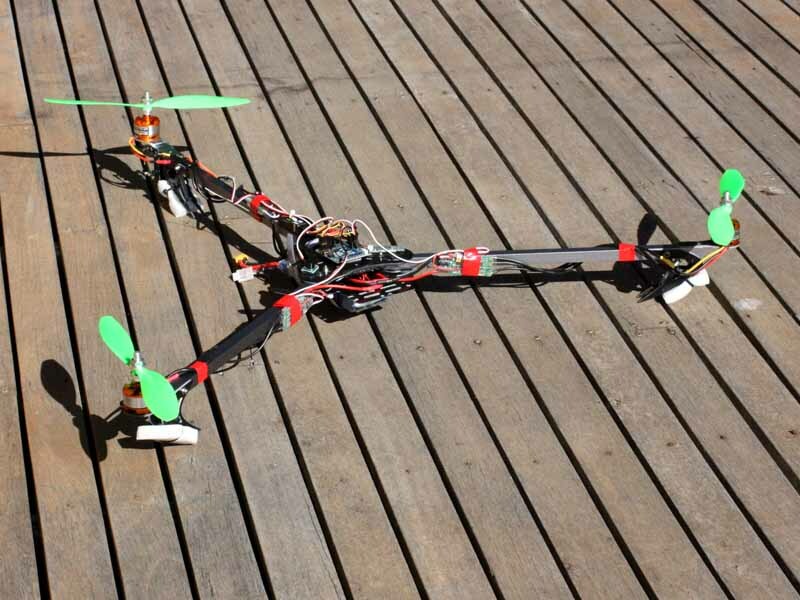 The tricopter is very hard to fly with 1245SF despite lots of time tuning pitch and roll, and level PID parameters. It appears that the propellers are just too much and that control loop stability is hard to achieve at lower motor speed. So, the 1145 propellers were refitted and fine tuning of the saved PID parameters commenced. The replacement servo works fine, stable stand alone with and without load, and mechanically smooth through its entire range (no sign of any stiff spots in the gears as in the previous one). The project is coming to an end, the tail mechanism is an obvious vulnerability in this implementation though it seems to work quite well… more in the final report.